The Polar Vortex has been making headlines across most of the United States recently. But, what exactly is it? According to NOAA, the northern hemisphere polar vortex is a high altitude low-pressure system anchored over the Arctic. More specifically, it is “the pattern of winds around the North Pole.” It is always present, but tends to be stronger in the winter. 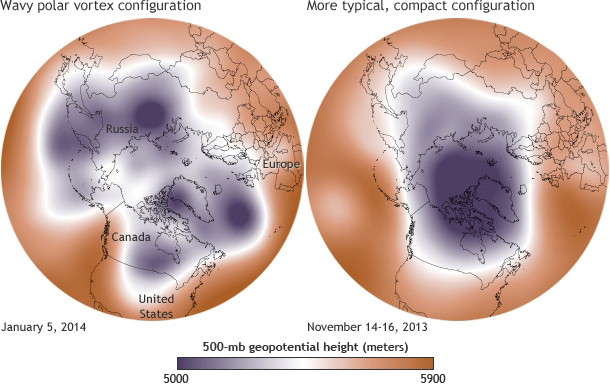 The configuration of the polar vortex – smooth or wavy – determines how much cold air escapes the region. Driven by the temperature difference between north and south, these winds typically circle the pole from west to east in a smooth pattern that bottles up the Arctic’s cold air. When these winds weaken, the pattern becomes wavy and cold air pushes southward. The connection between warming conditions in the Arctic (decreasing the temperature difference between north and south) and extreme weather events in the mid-latitudes is an active area of research. Some scientists suggest that increasing Arctic temperatures may be responsible for disrupting the pattern of the polar vortex. This entry was posted in weather and tagged cold, definitions, explainer, extreme weather, WRN by Melissa Fleming. Bookmark the permalink.